Virginia. 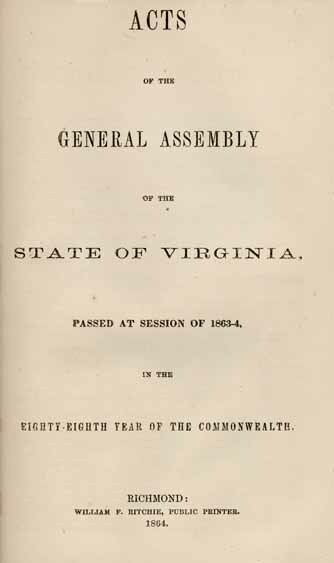 Acts of the General Assembly of the State of Virginia, Passed at Session of 1863-4, in the Eighty-Eighth Year of the Commonwealth. Acts of the General Assembly of the State of Virginia, Passed at Session of 1863-4, in the Eighty-Eighth Year of the Commonwealth. Richmond: William F. Ritchie, 1864.